The HSBC Premier World Elite Mastercard currently has an Informr score of 8.8 out of 10. This score is based on our evaluation of 2 sources including reviews from users and the web's most trusted critics. 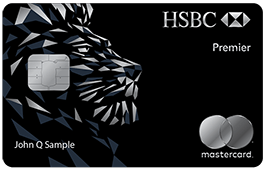 HSBC Premier World Elite Mastercard is typically available to those with excellent credit scores (650 or greater). Consider the HSBC Premier World Elite Mastercard® credit card if you’re looking for a premium travel credit card. It comes with a generous signup bonus, accelerated points on travel purchases and dining, plus you get annual travel credit and Uber and Lyft credit. Apply for the HSBC Premier World Elite Mastercard to earn 50,000 Rewards Program Bonus Points worth $750 in air travel, after spending $4,000 or more in the first 3 months from account opening. With this card you also have many opportunities to earn points back when you travel or go dining. Transfer your points to air miles with participating airline partners. $100 Annual Air Travel Credit to reimburse ticket purchases, seat upgrades, baggage fees or in-flight purchases. Complimentary membership to over 850 airport lounges, plus up to 15% off airport retailers. $100 Annual Statement Credits for rides with Uber and Lyft.